My cleansing routine is pretty elaborate: I take off the first layer of make-up with micellar water, use a waterproof makeup remover when needed on my eyes, then do a first cleanse with an oil or balm, do a second cleanse with a cream or gel cleanser and then continue with one or often two toners. It's a whole lot - and it can be a little expensive. I like to invest in the two cleansers and two toners, but for micellar water and make-up remover I mostly just want something that won't irritate my skin and will do the job effectively for the best price possible. 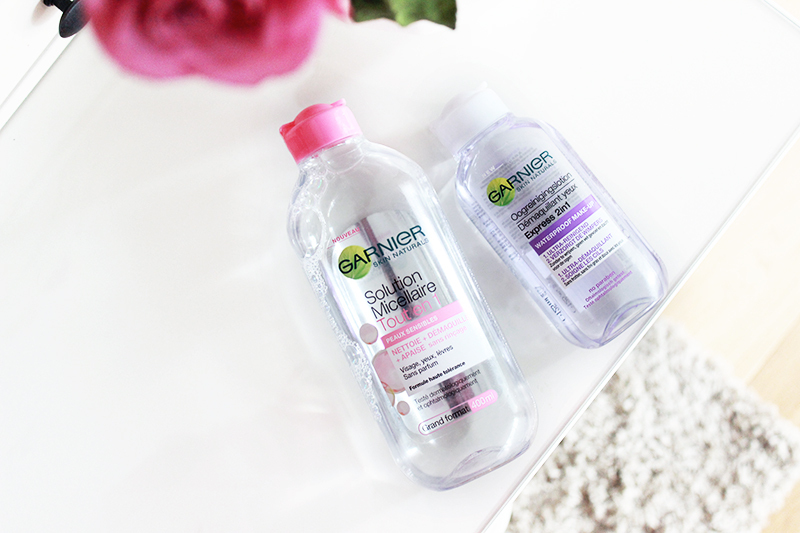 I have been trying different products and have now finally ended up with a favourite duo: Garnier Micellar Cleansing Water and Garnier Express 2in1 Eye Make-up Remover. The Garnier Micellar Cleansing Water has been with me since last year, but only since recently have I only been repurchasing this one. I used to stock up big time on Bioderma whenever I was in France, but my little stock is now finally all used up. I think I'm now on my fourth bottle of Garnier, so it's safe to say that I am a happy customer. It doesn't sting, takes off most of my make-up and if you're patient enough even removes stubborn make-up formulas. The Express 2in1 Eye Make-up Remover is a more recent discovery and has been the perfect aid when tackling waterproof make-up or any product that needs some extra force to be removed. It has a bi-phase formula which means you need to give it a good shake before using it; it's these kind of formulas that I have always found to work best with long wearing make-up. These two products have definitely found a permanent spot in my makeup cabinet - I wouldn't want to run out or cleanse without them!